Thank You for Giving Hope for the Holidays! Thank you to everyone who supported Britepaths' Holiday Program this season by sponsoring families or donating funds to help us ensure that families near us who are struggling can put their cares aside for a few days and enjoy a festive meal and gifts for their children. Because of YOUR generosity, we served 916 families for Thanksgiving and the December holidays -- far more than the 800 we had pledged to serve! A Season of Giving: Click Here to see how community members helped our families. Mail or Deliver Checks or Gift Cards: Britepaths' address is 3959 Pender Drive, Suite 200, Fairfax, VA 22030. Please write "Holiday Program" in memo line of checks. Most-needed gift cards are for major local grocery stores and Target or Walmart in denominations of $20-$25. "Donate" a Post! Follow us on Facebook, Twitter, Instagram and LinkedIn and share our messages. Tag us @britepaths (@britepathsfx for Instagram) if you post about us. The holidays are a time for sharing, and there is no better way to celebrate the spirit of the season than by helping your neighbors in need. 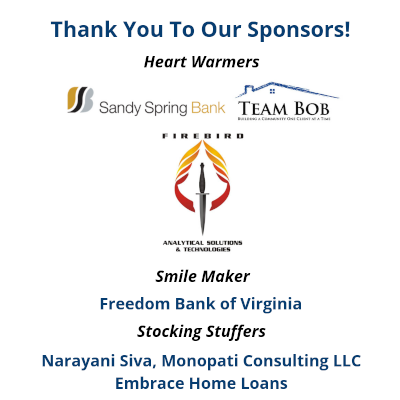 We hope you will consider sponsoring a Fairfax County-area family in need for the holidays. This is Britepaths' 20th year of ensuring that struggling families in our community have help and hope at the holidays. Our Holiday Program matches individuals and families in need with donors who provide Thanksgiving and December holiday meals, as well as gifts for the children in the family. Families have demonstrated need and are referred to the program by Fairfax County social services agencies. Many of the families we serve work multiple jobs to make ends meet. Others are searching for work after being laid off or cannot work because of illness or injury or some other crisis. When you sponsor a family, you will feel the true spirit of the season. Participating in the Holiday Program is a wonderful group or family activity. And it’s a great way to give back to the community, because your help goes directly to a local family in need. Note: Our Program Has Changed a Bit, But Not for Our Supporters! 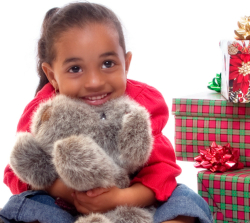 For many years, Britepaths held a contract with Fairfax County to serve as a clearinghouse to connect Fairfax County area families in need with community organizations, companies, faith communities, individuals and families who would help them for the Holidays. In 2017, Britepaths chose not to bid for that contract going forward so that we can better focus our organization's energies on our self-sufficiency and emergency assistance programs. For our supporters who wish to sponsor families or provide donations to help families who are not sponsored, our Holiday Program will operate exactly the same way as it has in the past. As part of the change, our organization is committing to serve fewer families than we did prior to 2017, but the families we serve will receive much more meaningful assistance. In 2017, we served 550 families and found that our supporters are so generous we could likely serve more. In 2018, our goal is to serve 800 families.